My blog is about everything that interests me about Thailand. My focus is on culture, art, history & the people of Thailand but also on travelogues & food. I'm a half-Thai very much interested in Thai culture, art and the country and people as such. Hence, Iï¿½d like to share this passion with you. I also very much enjoy creating all kinds of jewellery and decoupage art using traditional Thai brocade fabric. 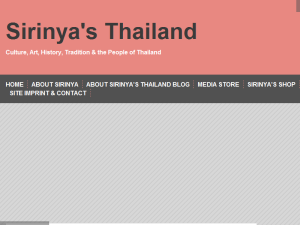 This what your Sirinya's Thailand Blog Ad will look like to visitors! Of course you will want to use keywords and ad targeting to get the most out of your ad campaign! So purchase an ad space today before there all gone! If you are the owner of Sirinya's Thailand, or someone who enjoys this blog why not upgrade it to a Featured Listing or Permanent Listing?